As part of their 30th Anniversary, American is now giving away $100 off coupons when you book a flight that costs $250 or more on AA.com from now until September 5, 2011. Registration link to get your coupon code. If you have a code you won’t be able to use, feel free to share it in the comments so we can help out fellow TPG readers who do fly AA! “In order to be eligible for this promotion, you must be the primary Citi / AAdvantage credit cardmember and have an open Citi / AAdvantage credit card on or before 8/10/2011. 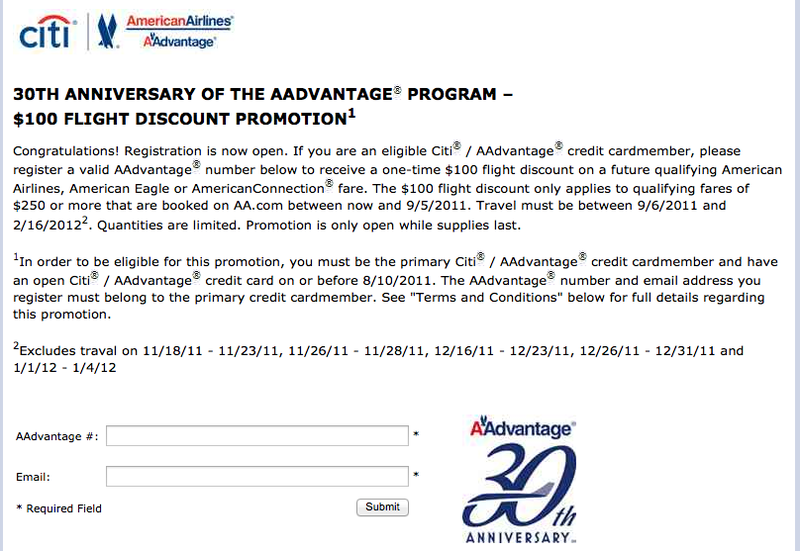 The AAdvantage number and email address you register must belong to the primary credit cardmember. See “Terms and Conditions” below for full details regarding this promotion.